THE DEVELOPMENT NEEDS INVENTORY (DNI), By J. Clifton Williams, Ph.D. Concentrate your energy and resources on the areas of most need! This cutting-edge online 360 is a fully customizable development assessment provides data including a management team’s strengths and development needs, plus the strengths and development needs of each individual leader described. The DNI can serve as a guiding compass for the direction of leadership development programs, training, consulting and coaching for use with individuals or with teams. The areas to be assessed are absolutely customizable, i.e. teambuilding, delegation, trust building, time management, etc. Please see the full list to the left. Dr. J. Clifton Williams, Ph.D. Effective Leadership is a comprehensive leadership development program including including topics such as: motivating skills, adaptability, communicating, decision making, interpersonal relations, etc. Please see the full list below. This program includes individual and management team exercises, questions for individual and/or group thought and discussion, steps for action planning, and prescriptions (possible courses of action). Standard version or in-house customization available. The Effective Leadership Series is an alternative for leaders who do not need a comprehensive program, but are interested in topical studies regarding specific leadership development areas. Topics available include all leadership development areas shown in the sidebar to the left. 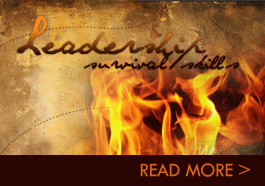 A comprehensive leadership development program for college students.